If you remember a few weeks ago, I reviewed some products that my daughter and I loved from the Shirley J Mugging! line. I was so happy with the products that I began wondering what else this great company had to offer. I decided that the Shirley J Slow Cooker Seasoning looked kind of interesting... and easy! Since I already had a pork tenderloin in the freezer, I decided that I'd start with the Pork Slow Cooker Seasoning. I had a feeling that the "recipe" to make a pork tenderloin (or pork roast) would be easy -- it's a crock pot recipe, so how hard could it be? But I honestly was shocked by just how simple it was. All I did was mix some of the seasoning with some water and pour over the tenderloin. Truly -- it was that easy. About eight hours later, I had a very tasty pork tenderloin with gravy! The Pork Slow Cooker Seasoning makes its own gravy and, while I'm not a huge gravy person, I do think it added a nice flavor to the meat. If I were a gravy person, this juice/gravy would have been perfect served over mashed potatoes! 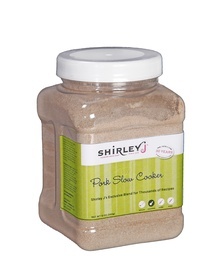 In addition to the Pork Slow Cooker Seasoning, Shirley J also has a Chicken Slow Cooker Seasoning and a Beef Slow Cooker Seasoning. I have yet to try either of these, but I have no doubt that the beef one would be perfect for French Dip sandwiches. In fact, I am buying a chuck roast the next time I go to the grocery store. While I was thrilled with just how simple this seasoning mix was to use, I also appreciated that the seasoning mixes do have some versatility. For example, I found some a recipe on the Shirley J website for Pork Chili Verde which uses the pork seasoning mix along with a few other ingredients. There are also recipes for the Beef Slow Cooker that look equally simple and delicious! The Slow Cooker Seasonings come in 12 ounce containers for $8.95 which I think is pretty reasonable. You only use 1/3 cup of the seasoning with 2 cups water for up to three pounds of meat. So it does go a long way! I definitely recommend Shirley J. Slow Cooker Seasonings as a great way to make a quick and easy dinner for your family! Thanks to Shirley J for providing the Slow Cooker Seasoning samples. I'm all about easy when it comes to cooking these days! This sounds terrific! How easy is that?? These mixes would make weekday cooking a breeze. 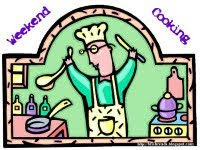 Thanks as I always like to try out new recipes and ingredients.